No-no #1: Try to avoid social obligations and clear your calendar. Didn't happen - my friend asked me a week ago if she could stay with me over the weekend since she was in New York for work. I thought about it and figured, why not. No-no #2: If you can, try to avoid doing The Clean Program during times of transition such as job change or moving. Nope - in a moment's notice, my brother decided to move out of New York and back to California. I had to help him clean, pack and move over the weekend. Just when I thought I could avoid the outside world altogether and just watch more episodes of Sherlock (one of the most amazing shows on TV by the way), I had to attack it head on. It didn't help that work has been the most demanding week I've experienced in a long time. In life, you really do have to try to look past the negative and find the silver lining. 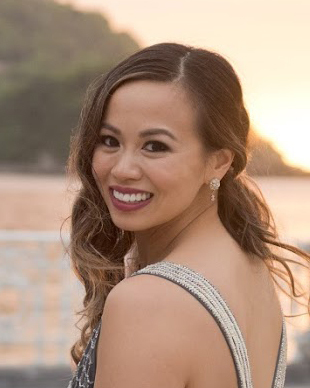 Through the crappy week, I found some things that would prepare me as I headed back into "normal" life - The Good, The Bad, and The Ugly. One of the best things about having visitors is that they force you to break out of your normal routine and turn on tourist mode. However, this time around, since I was cleansing, I felt like I was seeing the city with new eyes, CLEAN eyes. Unrelated to the cleanse, but, the first cool touristy thing we spotted was a photoshoot in the middle of Flatiron. It was freezing still, so the model had someone whose sole job was to cover him with the jacket every other minute. It was funny to watch him strut back and forth as the photographer tried to get a good shot of him in the sun. Since I was forced to go out and eat, I discovered raw vegan food at Quintessence - LOVE the cashew "cheese". We also had to find other cleanse-worthy restaurants such as Westville, which accommodates visitors who aren't necessarily raw vegan enthusists. 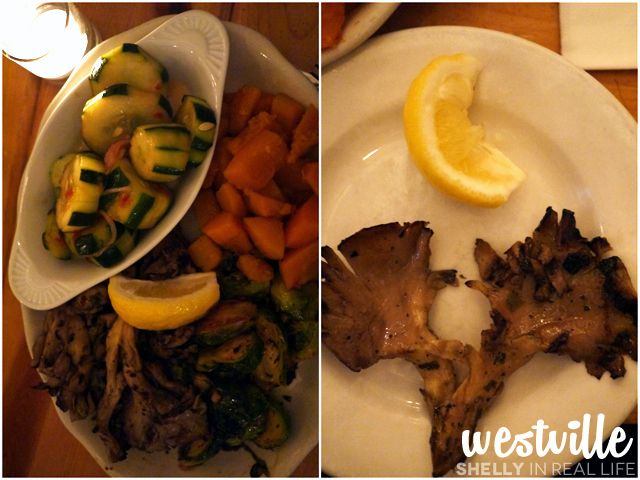 The photo above is Westville's entree of 4 sides, for only $15! Not bad for a loads of healthy veggies - the grilled oyster mushroom is worth trying. 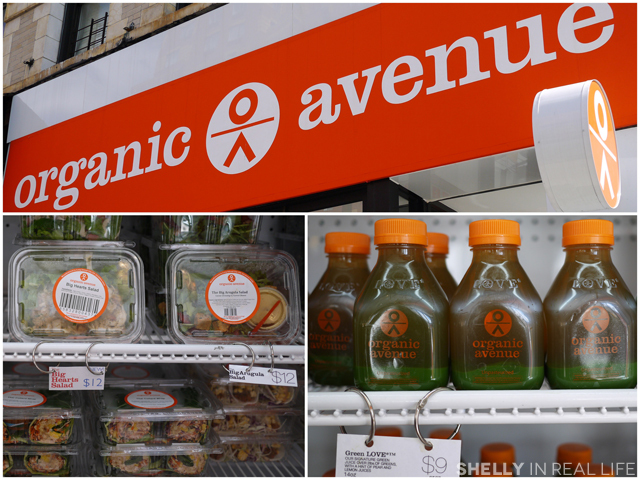 I was also more aware of where I could get my hands on some green juice, such as Organic Avenue, which has locations sprinkled throughout Manhattan. The photos here is from their Chelsea location at 8th Ave and 21st. I know, the $9 juice is actually pretty pricey, but if you're also paying for your health, which is pretty priceless in my opinion. 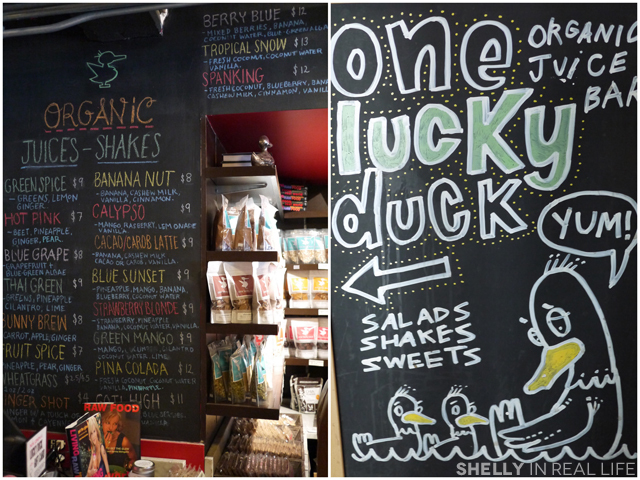 I've also always heard of One Lucky Duck in Chelsea Market but never got to visit. Well, what better excuse than to bring my visitor to check it out. 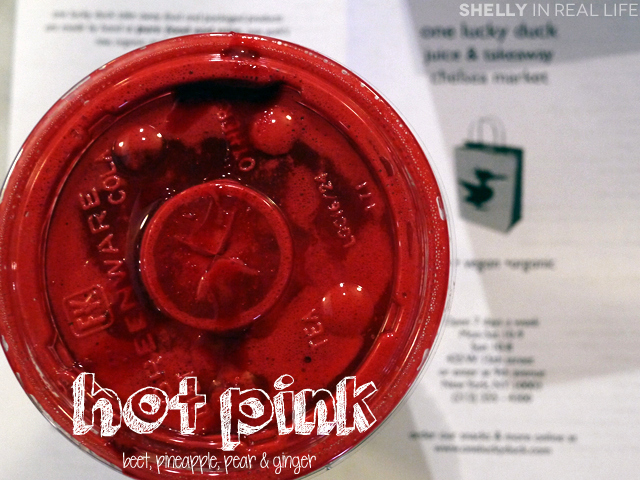 I ended up ordering the Hot Pink juice, which was made from beets, pineapple, pear & ginger. This drink really lived up to its name because boy was it HOT HOT HOT. The ginger juice in this made the drink so spicy that I couldn't finish it. Take it from someone who drinks a lot of ginger shots, this drink is HOT. 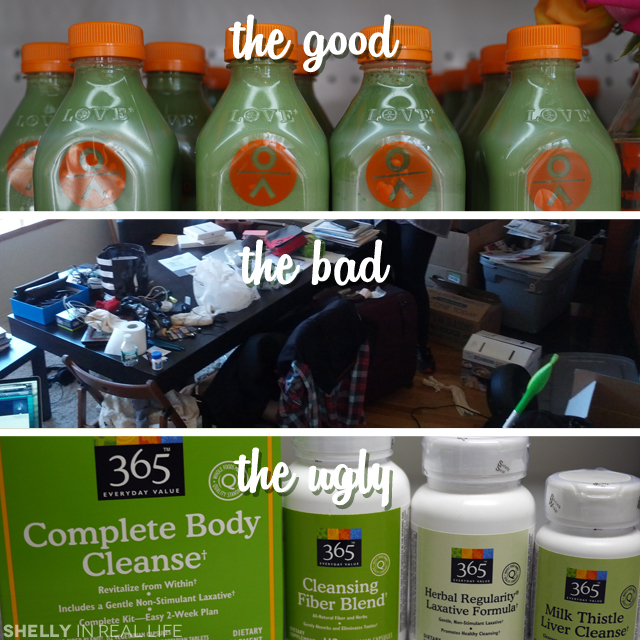 Despite my less than perfect experience here, I would love to try some of their other juices. The Bad & Ugly coming up in the days ahead! Previous posts: Day 9-12: We Must Dig Deeper, Day 13-16: You can fool me, but you can't fool yourself!